Please note: By purchasing this product you confirm that you have read and accepted the licence agreement (see below) and the licence terms. The GMP Compliance Adviser is an online publication that covers all aspects of Good Manufacturing Practice (GMP) in one source. This part contains 24 chapters with GMP expert knowledge to base your decisions upon. It provides practical assistance with checklists, templates and SOP examples. These 8 chapters cover the most important GMP regulations from Europe and the United States (CFR and FDA), but also PIC/S, ICH, WHO and many more. The “GMP in Practice” part is written by 88 authors with hands-on experience directly linked to the industry. The individual chapters describe the different aspects of GMP in a clear language. Technical, organizational and procedural aspects are covered. More than 700 checklists, templates and examples of standard operation procedures taken directly out of the practice help you in understanding the GMP requirements. Reach your GMP compliance with the support of the provided knowledge! The GMP Compliance Adviser is used by more than 10000 professionals in over 70 countries. Related links to "GMP Compliance Adviser Single User Licence (12-month-subscription)"
Video: GMP Compliance Adviser: GMP Knowledge for Job and Career! 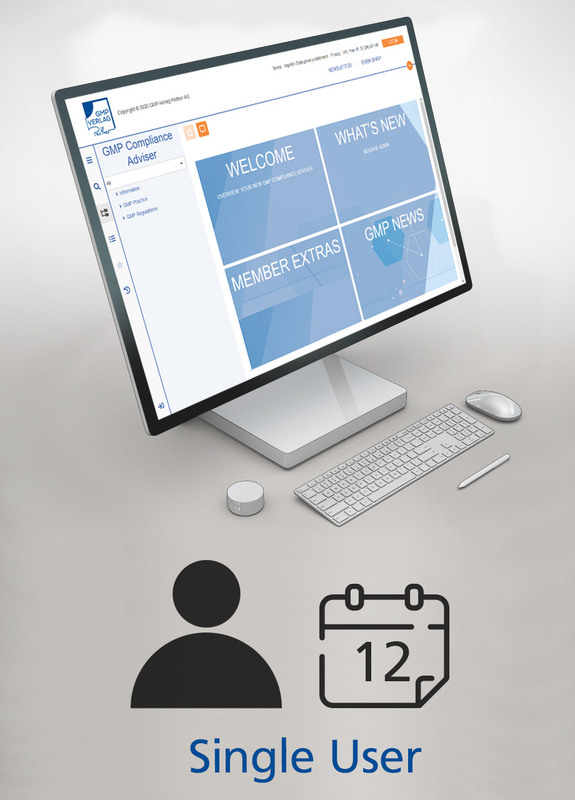 The GMP Compliance Adviser is very easy to use! The GMP Compliance Adviser is revised on a regular basis to support you with the latest information. Each update includes either entire new chapters, or some chapters may be partially renewed/supplemented according to the latest GMP guidelines. You won’t miss any important changes, because you will be automatically informed about the updates with our e-mail service “GMP-Insider”. Note for the user: This is a contract between you (“licensee”) and the Maas & Peither AG – GMP Publishing (“licenser”). By using the knowledge portal on your computer you agree on all terms and conditions of the present contract. All rights to the knowledge portal are with the Maas & Peither AG. This licence agreement applies for the following product. You obtain the simple, non-exclusive, personal and non-transferable right to use the knowledge portal after receiving the payment and setup of the access. The right of utilisation only applies to you and cannot be transferred to third parties. The licence is valid for a minimum of three months. After this time the licence may be terminated in writing on a month-to-month basis by the licensee. The Maas & Peither AG – GMP Publishing is particularly entitled to terminate the contract for cause without proper notice if the licensee does not pay in time or provably misuses the knowledge portal. You obtain the simple, non-exclusive, personal and non-transferable right to use the knowledge portal after receiving the payment and setup of the access. The right of utilisation only applies to you and cannot be transferred to third parties. In the first year, the licence is valid until the 31st of December of this year. The licence extends automatically by twelve months if it is not cancelled in writing one month before the end of the term meaning 31/12 of each year. The Maas & Peither AG – GMP Publishing is particularly entitled to terminate the contract for cause without proper notice if the licensee does not pay in time or provably misuses the knowledge portal. This is a concurrent licence model: it allows multiple users the access, but limits the number of simultaneous users to the number of licenses purchased. After receiving the payment and setup of access you will obtain the right of utilisation. The licence is valid for a minimum of three months. After this time the licence may be terminated in writing on a month-to-month basis by the licensee. The Maas & Peither AG – GMP Publishing is particularly entitled to terminate the contract for cause without proper notice if the licensee does not pay in time or provably misuses the knowledge portal. This is a concurrent licence model: it allows multiple users the access, but limits the number of simultaneous users to the number of licenses purchased. After receiving the payment and setup of access you will obtain the right of utilisation. In the first year, the licence is valid until the 31st of December of this year. The licence extends automatically by twelve months if it is not cancelled in writing one month before the end of the term meaning 31/12 of each year. The Maas & Peither AG – GMP Publishing is particularly entitled to terminate the contract for cause without proper notice if the licensee does not pay in time or provably misuses the knowledge portal. The licenser provides the contents of GMP Compliance Adviser in accordance with the terms of a licence for online products to the licensee.